It gives me a warm feeling inside to see at least part of F1 returning to the good old days. To read Luca di Montezemolo's recent comments to Gazzetta dello Sport takes me back to the days when the entire world was at fault for Ferrari mistakes, when weaknesses could not be admitted and the cars never lost races, the drivers did. Apparently, it is "humiliating" for the sport to rely on Safety Car periods to spice up races. Strange that Luca should never have mentioned this before, considering that the SC has been around for years and its appearance always has an effect on race results. I recall many races won by Michael Schumacher thanks to SC periods and yet no muttering from the Ferrari camp about humiliation at the time. The purist will point out that the SC often wipes out an advantage built by the skill of the leader over most of the race, but the majority of F1 fans are happy to see things mixed up a bit and unexpected drivers standing on the podium. The SC is an unfortunate solution to one of racing's problems but it is hardly humiliating. The temptation is to believe that Luca is really smarting under the humiliation of his team completely botching a race that they should have won easily. And the pill that Luca needs to swallow is the fact that he had his part to play in the fiasco that was Ferrari's Singapore GP. It was he who disbanded the dream team that swept all before it and it is he who now issues his decrees for the team to meet, so placing unnecessary pressure on Stefano Domenicali, who still struggles to weld the team into the efficient machine they were so recently. But Luca continues to demand that the team produce the results he requires; now he is expecting one-two finishes in the three GPs that remain. Domenicali may protest that his team makes no more mistakes than they did in the Todt/Brawn/Schumacher days, but it is obvious to everyone that they have fouled things up more often in the last two seasons than the triumvirate managed in their entire existence. It is no shame to be less than the most effective team ever known to F1 and a little realism and humility would go a long way to solving Ferrari's problems. Realism is a rare commodity in the Scuderia's world, however, and Luca blames street circuits as well as the SC for the catastrophe that was Ferrari's race in Singapore. There is no overtaking, he claims, apparently unaware that Rosberg and Hamilton, amongst others, managed it. Perhaps it is just too painful for him to remember that Massa was passed late in the race by Robert Kubica, something that should have been impossible according to Luca. And now Luca is going to take the matter to the other team managers, no doubt in his capacity as the head of FOTA. It means nothing that they have already expressed their happiness with the Singapore GP, some even declaring it to be the way forward for the sport. Somehow I doubt that they are going to be swayed in their judgement by such sour grapes from Ferrari. I will grant that Luca has done the right thing this season in always being supportive of his drivers. There does come a point, however, where one must honestly assess a situation if one is ever to solve problems. He may consider Massa to be "the best" but it is wrong to ignore the rumors that the Brazilian can only win from the front. He was unbeatable while in the lead in Singapore but made many mistakes when fooling around at the back of the field. Raikkonen, too, has failed to live up to his reputation, apparently satisfied to post fastest laps as if apologizing for far too many lackluster races. The reality is that this just raises more questions, making us wonder why he is unable to perform at that level throughout the race. Luca does his team no favors by taking such an unrealistic view of their capabilities. He should, perhaps, have taken a lesson from Dr Mario Theissen on how to handle a driver who suddenly finds himself disadvantaged by circumstances beyond his control. Earlier this year, it was common knowledge that Nick Heidfeld was having difficulties in qualifying, since his driving style was not warming the tires quickly enough. Dr Mario ensured that the team worked with Nick (even to the extent of annoying Kubica, who wanted just as much attention) until the problem was overcome; this, surely, should have been Ferrari's approach with Raikkonen. The Ferrari system of lights for pit release should also have been thrown away after the Valencia GP. It was a pretty idea but was shown to be badly flawed long before Singapore. A driver will always react to a lollipop being thrust in his face after early release but is unlikely to respond so quickly to a light that changes and then changes back. The team's persistence with the system after Valencia shows most clearly that they are not being honest with themselves - and that can only be the result of the pressure being applied by Luca. The Ferrari president can continue to huff and puff in the face of reality (and I, not being a Ferrari fan, hope he does) but he is not helping the team when he does so. The truth is that he needs to stick to what he does best, selling road cars, and he should leave the F1 team to his chosen manager. Clive, I believe Luca has found a supporter in Dr. Mario! BMW team boss Mario Theissen was left fuming by the Safety Car refuelling lottery. "This has ruined Robert's chances at a crucial point in the World Championship," he told the team's website. "I don't know whether we have lost second place - Robert was actually ahead of the eventual winner Alonso. I am very disappointed that the safety-car rule has affected us again." Peter Sauber was equally upset. "We had a great chance of finishing on the podium, and scoring well in both title races," said the Swiss. "This rule is unfortunate, to be polite." Both Theissen and Peter Sauber were referring to the closing of the pit lane and not the safety car itself, I believe. I am probably alone in considering the SC to be an abomination that should never have been allowed into F1 - at least, I was until Luca found out that it can disadvantage Ferrari as well as other teams. Theissen's attitude is especially understandable, since this is the second time this season that the closure of the pit lane has robbed BMW of a potentially excellent finish. When the new SC rules were brought in, I pointed out the obvious weakness in that cars due a pit stop would have no option but to refuel and take the resulting penalty. As you say, Journeyer, team managers tend to regard the SC rules according to how fate has treated the team most recently. If they had the foresight to realize that no bad rule should be allowed to remain, whoever it benefits or disadvantages, they could have stood against its introduction as a united force and the FIA would have changed it by now. As for the SC, I do not fool myself into thinking that Luca will remain my ally for long. Another race will come along in which the SC gives the advantage to Ferrari and his objection to it will be forgotten. Haplo: We? Don't include me, old friend - I hope Ferrari carry on shooting themselves in the foot for the rest of the season! Gusto: The SC was controversial when it was first introduced but that has died down in the ensuing years. Basically, it has become a lost cause - people have accepted it because it has been around for so many years now. But I still object to the way it robs deserving drivers and gives to the merely lucky. There has to be a better way. i hate the sc too, but i support it because of the people who end up cleaning the messes that cause the sc to be deployed in the first place, not because it's just wormed it's way into my complaisance over the years. anyone recall pryce at kyalami? yeh, not likely to happen these days but sometimes a local yellow just isn't going to be enough. so what would your solution be? if there has to be a better way, i'd guess you've already thought it out pretty extensively. Ah, now you're asking. My natural inclination would be to go back to the old system of a full course yellow - but, as you say, this still beings an unacceptable element of danger to the marshals. How about if the pit lane speed limiter and standard ECU were to be used to automatically impose a speed limit on the cars for the duration of the yellow? If the pit lane speed limit is low enough to protect pit crews, would it not be even more so for marshals? That way, no car would gain an advantage over others, each could pit on the lap planned and gaps would remain about the same as they were before the yellow. I made clear that I don't like the whole thing of the safety car rule, although is part of the game and it has to be understood that way, IMO. But what Mr Luca di bla bla bla has done is just cross the river, cross the line. --"This bunch of mini teams full of monkey drivers should step appart and don't steal our legitimate wins using something so dirt, so underlaw as the safety car"--..... come on.... it's unnacceptable. And Mr Dennis, and Mr Theissen (what a perfect moment to keep that huge mouths closed) were as quick as a flash to take their part of the cake, because they feel the same.... --"Those bastards have won us because of the safety"--..... NOT AT ALL... The safety is there for everybody. The Keith's live blog had a poll about how many safety cars were to come.... and nobody answered cero..... Be clever, and prepare at least, one of your drivers for that. I said somewhere, don't remember, that one think I really liked about that last race was that, in a world of fully computerized and simulated standard strategies, one team did soomething different that wasn't on the simulations and it worked (as 4 stops worked for Schumacher and Ross Brawn against Fred at French race ¿2003 or 04?). Those cero-brained strategists have always the same solution for those qualified 6th or behind... full tanks and one stops... and let's live a procession of a race..... That's what Luca, Mario and Ron want to do, charging against the safety car rule. No diversity at all, no variable things that could disturb their straight row of victory from victory. DON'T SUPPORT THAT!!! I find Di Montezemalo's comments rather hilarous to be honest talking about these "clown tracks" when it's his team that are performing like clowns at the moment.McLaren have also done some stupid things in the recent past but I have always had the feeling something bizarre is going on at Ferrari since the "dream team" all went their separate ways. The car is excellent , if a little unreliable by modern standards but should really be winning more races.Kimi seems somewhat demotivated having won the title last year , and Felipe isn't really a top-class driver just yet (but I think he will be fairly soon).I thought when Michael retired he retired two years too soon and it seems I'm being proven right because there's just been too many occasions when Kimi has switched off (last year too) when I certainly don't imagine Michael switching off .I'd go as far to suggest barring the effects of operational screwups he'd win this year's title quite comfortably because he'd extract more from the car much more consistently than Massa. Just on the Safety Car issue - the SC's been around since 1993 and it's only now that there's been problems with cars racing straight to the pits for fuel? I think the solution to this problem will in itself present cause more problems - so why not leave the old rules in place? - Don't fix what's not broke. I always thought who ever came up with the idea of in race re-fuelling must be a Pyromaniac,which is were the problem lies,if they done away with it I think the problem would cease to exist.But when you here of a driver getting a penalty for overtaking under waved yellows(except kimi at Spa ;)you have to say they have to shoulder some of the blame in the race being slowed down,perhaps Ferrari could design some sort of traffic light system were the driver is......on second thoughts. i like the speed limiter idea -is the pit speed limit the same as the speed limit behind the safety car? just curious. i imagine they could tweek it to do two different kph/mph. and we have always agreed on the silliness of refueling. ditto the pit lights. didn't they start using them just so things like this didn't happen (although i always thought it was more about them saying "woo hoo, look at how fab we look" in flashing lights)? by the time that light went back to red massa probably couldn't even see it anymore. dumb. the only down side (and it's not really a downside, just a concern) i could see is that i would imagine the visibility and field of vision from the sc (and the fact that there are two pairs of eyes-the driver and the lookout ) is a bit more comprehensive than that from the race cars- especially in the wet. It is ironic that di Montezemelo calls Singapore a "circus track", given that F1 itself was affectionately known as a "circus" a few years ago. The whole thing looks like sour grapes to me. Though the pit lane closure rule is completely unfair, its removal would not have helped Ferrari one iota. What would help them is training their staff properly in whatever pit system they're intending to use. In particular, they need to learn not to pre-empt the process. What I have noticed this year is F1 needs rain or a street race to make the show interesting. The vast majority of races on natural road course where it has NOT rained have been processions with most of the passing taking place in the pits. I don't see much difference whether you use a full course yellow or a SC, but they have played with the rules regarding the SC a bit. Architrion: I think it's important to make the distinction between the SC and the rules that go along with it. As far as I know, the only person arguing against the SC itself is Luca - the rest are talking about the pit closure when the SC is deployed. And that has been a problem since its introduction, with drivers unfairly penalized merely because their strategy happens to coincide with the SC period. One can point at Renault and say they won the race because they prepared for a SC period but, in fact, they were lucky in its timing. Had Piquet had his accident a lap before Alonso's stop was due, instead of a lap after it, Fernando would have had his race as badly compromised as was Kubica's. There is no reasonable way to prepare for a SC except to pit as early as possible and even that is subject to an accident happening even earlier. The closed pit lane turns F1 racing into a lottery - in the circus, everything is far better timed than that. Francois: I could not agree more - don't fix what's not broke. Every time the FIA try to look ahead and prevent problems, they only succeed in making things worse. Either they need to stop seeing problems where none exist or they need to buy a new crystal ball. Verasaki: There is no speed limit for a yellow flag period - the cars are effectively limited by the speed of the SC. And usually the SC hammers around the track as fast as it can go, which is like a gentle cruise for an F1 car. No doubt the ECU could be adjusted to give two speed limits but, if the pit lane limit were used, the cars would be even slower than they are behind the SC. This should effectively compensate for the poorer visibility from a F1 car. The idea behind Ferrari's system of lights was to make pit stops quicker. They proved that it was a few thousandths of a second faster than the traditional lollipop system. Somehow the points lost through its flaws don't really compensate for the tiny amounts of time saved in those races where it has worked, however. Alianora: Exactly. Luca knows that it was not the pit lane closure that scuppered Massa in Singapore so he is not attacking that rule. He is actually saying that the SC destroys any lead that his cars might have built up - and that is so obviously true, it's not worth arguing about. But it's all smoke and lights to hide the fact that his team made a huge mess of Massa's pit stop, mainly because of their darling new pit release system. Had he any guts, he'd tell the team to consign the system to the bin and say no more about Singapore. Aracerdude: The big difference between the SC and a full course yellow with speed limit is that the SC bunches the field, so destroying any hard-won advantages, whereas the yellow would preserve the gaps and slow the cars to a safe speed at the same time. That would not have been true a few years ago, as all drivers steal a little bit to catch up to the car in front under yellows, but the advent of the standard ECU gives the FIA a useful tool to enforce any speed limit under yellows. What I'm trying to say is that Mr Luca, Mr Mario and Mr Ron don't want any kind of incident that can interfere on their perfect planed races and introduce a midfield as a potential winner. If they are succesful taking away each random factor then what will have is a pure and clean boredom fest where always there will be a McLaren, Ferrari or BMW winning a race. I don't like rain, it's absolutely random. Ask Felipe Massa and he will tell you that it's absolutely unfair that after a whole race in front of the pack, rain comes and throw all you god to the waste basket (Nurburgring last year). In fact, in MotoGP they suspend the race until it stops and then resume it.... because they apply what you say about keeping a well gained advantage. I'll say it again. Ron, Mario and Luca don't want midfielders stealing victories because of factors they couldn't predict. Yesterday was the stop on engine development. Today the safety car rules. Tomorrow any other factor that could alter a perfect simulated race. Formula 1 is not swimming, where the fastest always win. DON'T SUPPORT THAT!!!! Architrion: Well, you are right as far as you take it - any team manager wants to be able to win races without interference from outside forces beyond his control. It's his job to try to win every time, after all. And so we approve of rain because it throws an unknown factor at all the teams and the one that copes best is the one that wins. But the pit lane closure is a little different in that it doesn't affect all the teams, as rain does; it just picks on a few who have chosen certain laps to stop before the race ever began. And that is pure chance - they might as well set up a roulette wheel in the pits and decide who wins from there. Of course I want to see more teams joining the fight at the front. Ferrari versus McLaren gets dreadfully boring after a while. But I prefer it if the teams challenge the old order through merit - as BMW seems ready to do. If Renault get their act together and Honda surprise everyone with a KERS system that works, next year could be exactly what we've been asking for - a real competition between four or five teams in which any of several drivers could win. Clive - Having such deep insight as to the workings, psychology and strategies of a top F1 team, coupled with the quiet confidence that you know better than LdM - after all, the all-conquering Todt/Brawn/Schumi trio was only conceived, assembled and managed by him - I am somewhat surprised, as must be those who know and love you, including, of course, yourself, that no team has made generous approaches to acquire your services. I suppose their loss is our gain… Meanwhile, back in the real world, Brawn must be alternately weeping and laughing into his Sapporos at seeing how his formerly crack pit crews have degenerated into scarlet clad Keystone Cops. I know I am. The pitlane closure rule is wrong. Like others I would like to see re-fueling banned and I would also like to see routine tyre changes banned. Lets have the drivers sort things out on the track rather than have one bunch of statisticians guess better than another bunch of statiticians how much fuel to put in a car in qualifying. I am basically a racing purist and prefer the best driver/car combination to win. Alonso won because he had a problem in qualifying and the team did something different strategy wise. Rosberg was second because he pitted under the safety car and it took the stewards an insane amount of time to work out that he and Kubica were due a penalty. You have to question how incompetent you need to be to take 20 minutes to work out that someone pitted when the pit lane was closed. Surely those penalties should have been issued on the first flying lap after the safety car was pulled in. The problem with Ferrari's light system to me seems to be the guy with the override switch. If he waited until he had checked the pit lane was clear and the nozzle was out there would be no problem but it seems like his override switch is in the go position the whole time and as soon as the re-fueler presses his button the drivers get a green light. I prefer the good old fashioned lollipop because if anything goes wrong it can be slammed back down in front of the driver to give him a warning. No-one looks at the traffic lights after it goes green. It seems to me that Ferrari are missing Nigel Stepney who was the guy who drilled their mechanics. They need to find someone similar soon. I assume Luca diMontezemolo is trying to divert attention form his team's problems but given most of what I have read he seems to be drawing attention to them. Green Flag: Sarcasm becomes you, my friend, but on this occasion, it misses its mark. My field is not the management of F1 teams but the more straightforward one of logic. And I merely point out the flaws in Luca's logic when talking of the Singapore GP. 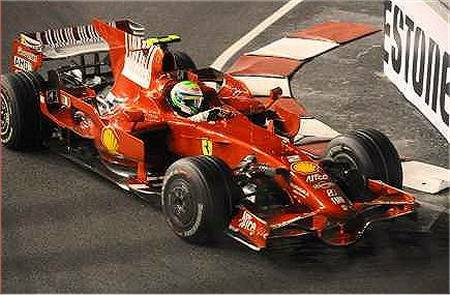 Like you, I blame the thing on sheer incompetency, not on street races, safety cars or anything else external to the Ferrari team, and it is a shame that Luca cannot see that his raging against such things solves nothing. And I certainly agree that Ross Brawn must be having a quiet chuckle to himself for it all enhances his already stellar reputation. Steven: Agreed, although Luca's complex motivation for such strange statements escapes me. Ferrari`s greatest Key Stone Cops moment must be Irvine`s stop at Monza? in 99 "There`s only three wheels on my wagon",it was funny to hear about the Mclaren mechanics cheering/jeering the Ferrari boys running up the pit lane,curious that after Rosgerg had time to drive like Fangio in the 57 German GP for 20 minutes,he then emerges just in front of Hamilton and Coulthard,and Luca is just acting like a Child `Huff Huff Iam going home,and Iam taking my ball with me`stomp stomp off he goes. Here's an idea that could maybe solve the lottery of refuelling with closed pits. Every driver's pit stop lap is given to race control in advance (sealed if you want). If the pits are closed at the specified lap, there will be no penalty. The strategy can be changed of course, but the insurance policy is voided in that event. There remains the possibility that a team could"arrange" for a safety car at the right moment to suit their favoured driver! Oh wait, that couldn't happen could it.